Whether it be high performance sports at the Olympics or the development of sports locally, sports education is becoming increasingly important in the modern world. There is a growing awareness of sports education as a subject in Indian schools. Tell us about SportyBeans. What is the USP of SportyBeans? 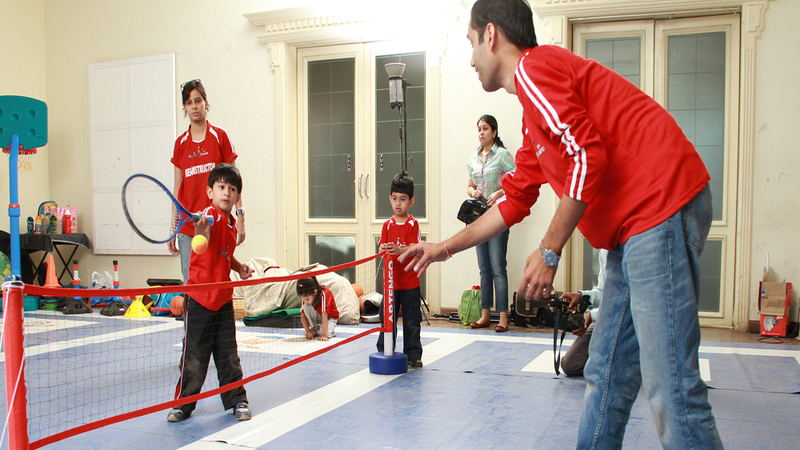 SportyBeans is India’s most reputable multi-sport program for children (aged 1.5-8 years). Our research backed sports curriculum teaches children the fundamentals of 9 popular ball sports (Soccer, Baseball, Hockey, Volleyball, Basketball, Cricket, Golf, Rugby and Tennis) in a social, non-competitive, team-based environment. SportyBeans seeks to promote a healthy lifestyle, develop a lifelong passion for physical activity and sport. Our aim is not only to teach the sport but to make the child’s first introduction to sport exciting and memorable. We are passionate about giving children, through sport, a solid foundation from which develop many aspects of their lives. Alongwith physical improvements, we carefully develop life skills, such as confidence, concentration, social interaction, sportsmanship values and many more, in a caring and fun environment. What led to the inception of SportyBeans? How has SportyBeans grown from the day of its inception? SportyBeans was started in 2009 by my brother Kapil and his wife Malika, with the aim of wanting to reinforce children’s natural love for physical activity and provide them with an understanding of the fundamentals of different sports. We started with a multi-sport program covering 5 ball sports and catered to the ages 2.5 – 6. We have since increased the age to 8 years and have introduced the focussed sport (3-4 sports), the Single Sport and the Parent Tot Programmes as well. Our multi-sport program now covers nine sports. From one centre at the Poona Club in Pune, it has now grown to over 40 centres across 25 cities pan India. Highlight the challenges faced by the brand. How did SportyBeans tackle them? Catering to an age group of 2.5 – 8 takes both patience and a sound understanding of the children. Keeping the sessions action packed and interesting for the kids has kept us on our toes ensuring we keep researching and coming up with new and interesting ways to engage the children at our sessions. With regards to growing the brand and increasing our footprint, we realised that ours is a program that needs constant monitoring and involvement in the centre and so instead of trying to open centres on our own, we chose the franchising route. We have however, been extremely choosy about who we award our franchise to. Sports education in India before SportyBeans came, involved children not less than 7 years of age. This meant that children below that age were not introduced formally to sport and were most likely to be relegated to trying to learn on their own or end up being addicted to screens (video games, cartoons etc.). This needs to change as not only does maximum gross motor development take place at earlier ages, but children can pick up skills better at an earlier age. And this is precisely what we at SportyBeans are trying to do. Parents too have realised that playing a sport provides numerous benefits to the child and in fact ends up giving them a more all-round development which in turn also helps them succeed academically. The potential for SportyBeans’ centres is tremendous and we target adding another 200 centres to our chain in the next 2-3 years. We have no specific tie-ups with educational institutions. However, at a local level, our franchisees do tie up with schools in their area to run in-school programs. Do you think that entrepreneurs need to look at sports education in India as a serious business? How can this be done? There is a vast untapped market that has the potential to be as big and wide spread as the pre-school industry. With lower set up costs, sports education programs have a much better ROI and definitely should be looked at by budding edupreneurs. Where does technology play a role in sports education? While we at SportyBeans do not use much technology in our programs, it can always be useful for monitoring, documenting and analysing the progress of the child. Where do you see the sports education industry after 5 years? Where do you see SportyBeans after 5 years? Our target is to reach a number of about 450-500 centres pan India in the next 5 years. With more people becoming aware of the importance of the sports education industry, we see more players coming into the market in the years ahead. Thus, with increasing trend, sports education industry is going to grow at a faster pace in the years to come as parents have started to realise the importance of sports. With low initial investment and high returns, this sector of education will bring in many enthusiastic edupreneurs in the years to come.